David Schenker October 16, 2013 With Sunni-Shiite conflict consuming Iraq, Bahrain, Syria, and Lebanon, headlines from the Middle East these days are dominated by news of sectarianism. But an equally important intra-Sunni conflict is also playing out between various Islamist and more secular-leaning constituencies across the region. 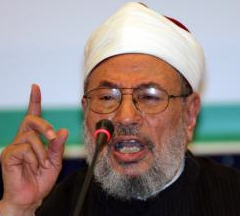 Qatar-based Egyptian cleric Yusuf al-Qaradawi is emblematic of this struggle. Despite positioning himself for years as the vanguard of the moderate al-Wasatiyyah Islamic trend, Qaradawi has issued controversial religious edicts in recent months supporting Sunni-Shiite conflict in Syria and the restoration of deposed Islamist president Muhammad Morsi. These fatwas have placed the eighty-seven-year-old cleric at the heart of two of the region’s most polarizing issues. BACKGROUND Qaradawi is the highest-profile Sunni cleric in the Middle East. In addition to heading the influential International Union for Muslim Scholars (IUMS), he is a prolific author and stars in his own Sunday primetime Aljazeera show, which reaches an estimated 60 million viewers. He is also the ideological lodestar of the Muslim Brotherhood and a booster of its Palestinian terrorist chapter, Hamas. At the same time, he is an outspoken advocate of democracy and political reform. Qaradawi’s views — on suicide bombings against Israel (which he deems legitimate), wife beating (which is permissible if ‘light’), Shiites (whom he calls ‘heretics’), and other issues — have long made him a controversial figure in Washington and the West. In the Middle East, however, he has long been viewed as a relative moderate — at least until recently, when his pronouncements became more provocative and uncharacteristically divisive. A few weeks ago, his deputy at IUMS — Mauritanian cleric Abdallah bin Bayyah — resigned his post, purportedly due to disagreements over Egypt and Syria. SECTARIAN HARDLINE ON SYRIA Qaradawi’s ideological shift on Syria was spurred by the August 21 chemical weapons attack near Damascus. By that point, the Assad regime had already killed tens of thousands of Syrians by conventional means, a massacre that Qaradawi routinely condemned from his pulpit in Qatar. During a Friday sermon in April, he even asked Washington to protect the Syrian people as it had the Libyans.